If you've been following my blog for a few weeks, you might be asking yourself why I need 18 million cups of homemade pasta sauce and fresh ricotta. 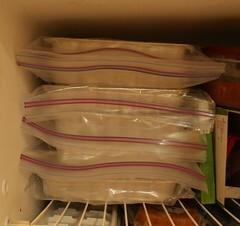 Ok, perhaps now that I put the two together it makes perfect sense - I've been putting together freezer lasagnas for the days before and after the baby arrives. I wanted to make sure we'd have lots of simple and balanced meals in the freezer and since we love lasagna, it was a natural choice to make. 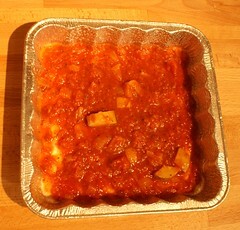 Mixture of ricotta, mozzarella, Parmesan and beaten egg in the following proportion: 1 cup : 1 cup : 1/4 cup : 1 egg per pan. TIP: When you mix these together, don't overwork it. It is actually easier to spoon it into place if it is the consistency you'll see in my photos below. Spray your baking pan with a little olive oil cooking spray (or wipe some olive oil around with a paper towel). Put just enough sauce in the bottom of your pan to cover it - remember, this contains the liquid that will eventually cook the bottom layer of your no-boil lasagna noodles. 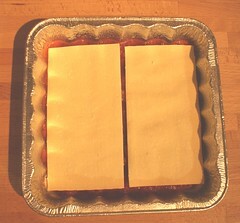 Lay down 2 lasagna noodles on top of the sauce. Spoon about a cup of the ricotta / mozzarella / Parmesan / egg mixture on top of the noodles. Add more sauce on top of that. 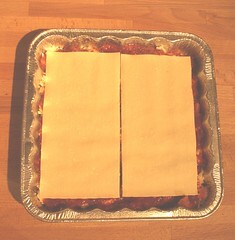 Lay down 2 more lasagna noodles. Sprinkle with more mozzarella and some parmesan. Cover tightly with the plastic wrap doing your best to press air out. Slide the pan into a labeled plastic bag. Load it into the freezer. 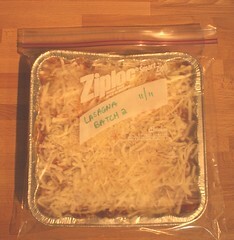 Pull the lasagna out of the freezer 24 hours before and allow it to defrost in the fridge. Preheat the oven to 375 degrees. Remove the plastic bag and wrap and cover the top with foil. 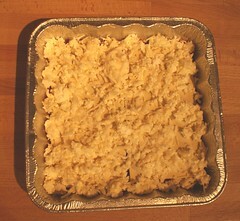 Bake for 45 minutes or until it is warm throughout. 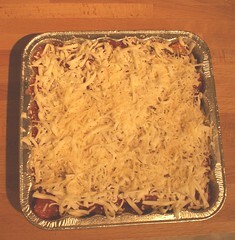 I then like to remove the foil and broil the dish for a few minutes until the top cheese is bubbly and a little browned. 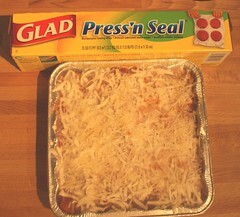 If you didn't pull the lasagna out the day before, you CAN cook it from frozen. Preheat the oven to 400 degrees. Remove the plastic bag and wrap and cover the top with foil. 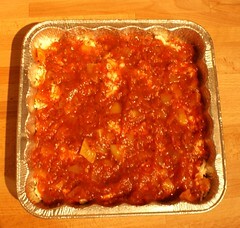 Bake for 1:15 minutes or until it is warm throughout. Again, I then like to remove the foil and broil the dish for a few minutes until the top cheese is bubbly and a little browned. Don't forget to add the pans of lasagna to your freezer inventory list! I love how prepared you are. Not too much longer for you! Hope all is well.